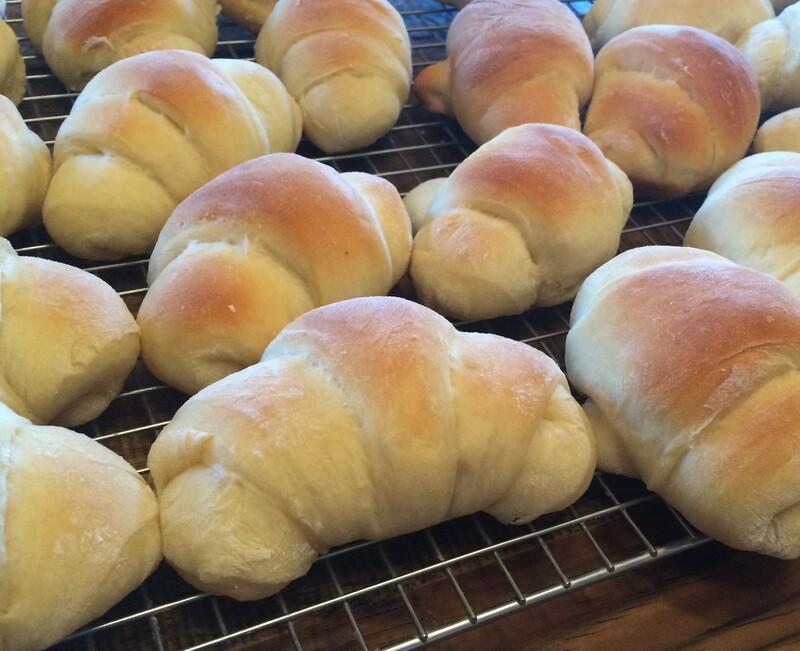 Nothing beats a homemade yeast roll. Or several rolls. I don’t claim to have dreamed up any of the recipes I depend upon, but I collect great recipes and tweak them here and there to suit my tastes. If my memory serves, the basis of this recipe came from my sister who married a man from the German Baptist community. They know how to cook. These rolls are worth the time, but don’t start them unless you are able to devote a few hours periodically working on them. We had a snow day today, so it was a perfect opportunity to mess with butterhorns while working on other projects. Dissolve yeast in water and set aside. Beat eggs. Add sugar, margarine, salt, and water. Mix well. Add yeast mixture and mix well. Cover and let rise in bowl until double in size. Knead lightly. Divide into 2 parts and roll out in circles. Cut into pie shaped wedges. Roll up from the wide edge to the point, shape into a crescent. Let rise until double in size. Bake at 350 degrees for 10-15 minutes. Makes 2 dozen large butterhorns. If you are familiar with the art of working with yeast, feel free to launch into the fuss-free recipe posted above. But if you are a novice to making bread with yeast, I will give you a few tricks of the trade that have worked for me. Let me also say, most of my recipes are huge because I tend to bake on a large scale. The rolls shown are the result of a triple recipe. The posted recipe above is a manageable 2 dozen. You can whip up this recipe in a big Kitchen-aide mixer or by hand with a wooden spoon and a large bowl. Both processes are valid. Rolling pin and pizza cutter are extra helpful. This is what you hope to start with. A nice big pile of warm smooth dough. But you won’t get here without careful attention to ingredients. Yeast is a plant and a touchy one at that. It dissolves nicely in a little water and because yeast loves sugar, just a teaspoon or so makes it act more quickly. The temperature of water must be lukewarm, technically 115 degrees. For me, the temperature is correct if I can hold my pinky in warm water without feeling a burning sensation. If the water is too cold, the yeast will be slow to act; if it is too hot, it will kill the yeast entirely. 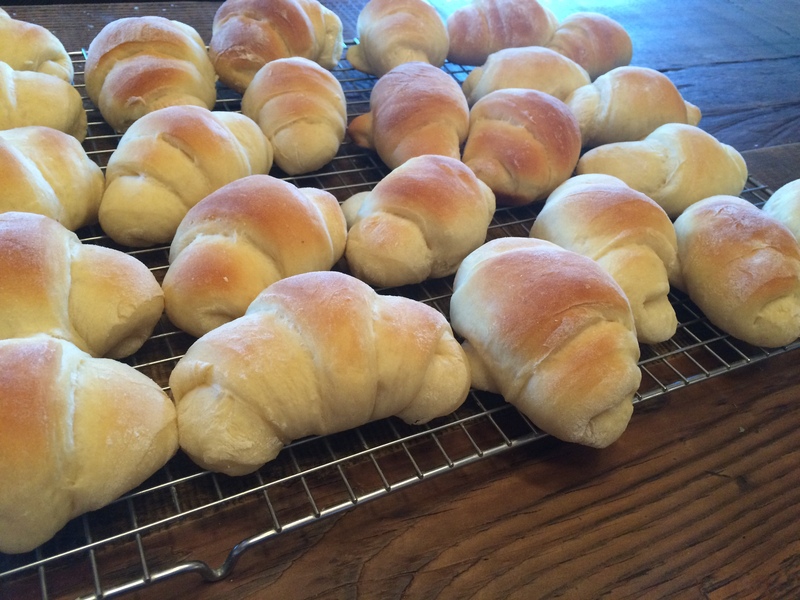 Yeast is the ingredient that makes your rolls light and fluffy. Kill your yeast, and you will bake nice little bricks. When yeast works, the mixture expands. So if your dissolved yeast is acting, it will bubble up with a head of foam like beer. (Since yeast is used in beer, this makes a little sense). While the yeast is doing its thing, you will mix the other ingredients. In a perfect world, all your ingredients are room temperature. I usually don’t manage to prepare that far in advance, so I melt the margarine in the microwave. Melting margarine can lead to a high temperature but I use it to offset the coolness of refrigerated eggs. However, if you introduce a cold egg to boiling margarine, you will cook the egg. So mix the sugar with the margarine as a buffer and then add the eggs and other ingredients. By the time you have these mixed, your yeast should be bubbling as proof that it is working. Add the yeast mixture to the rest of the ingredients and incorporate flour one cup at a time. The next step is kneading. I have a dough hook with my free stand mixer, so I mix well with this attachment as my first kneading and then let the dough rise in the bowl. These rolls must rise twice. 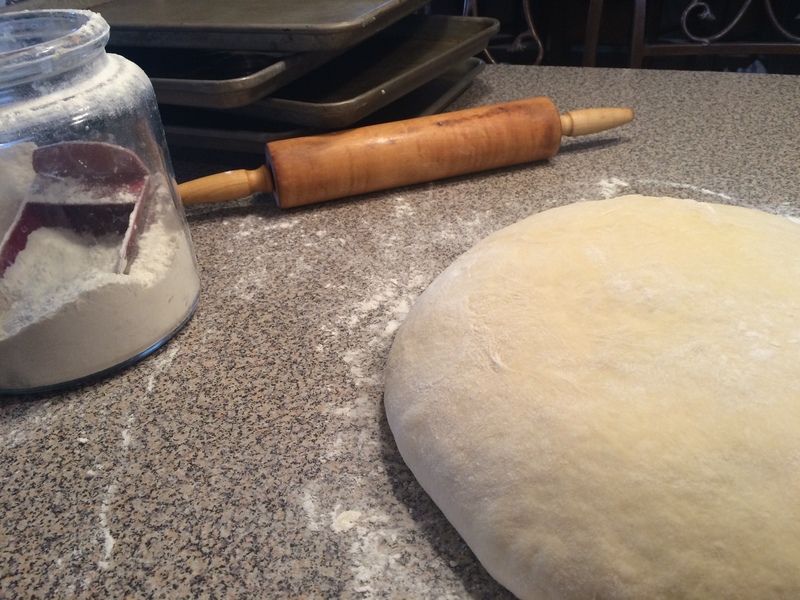 Whenever dough is rising, it should be covered lightly with a lid or tea towel so it doesn’t develop a crust. 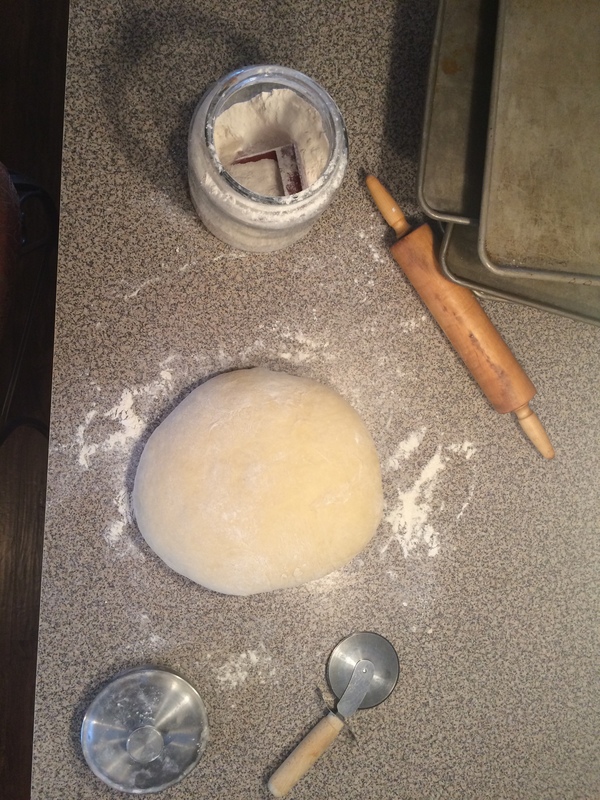 An hour or more should allow the dough to double in size. But given a rainy day or a cool room, it may take longer. When it is double from this first rising, punch it down or deflate it with your finger and turn out onto a floured surface. It feels a bit like popping a balloon! Knead the bread by folding it in on itself over and over until it becomes a smooth ball. 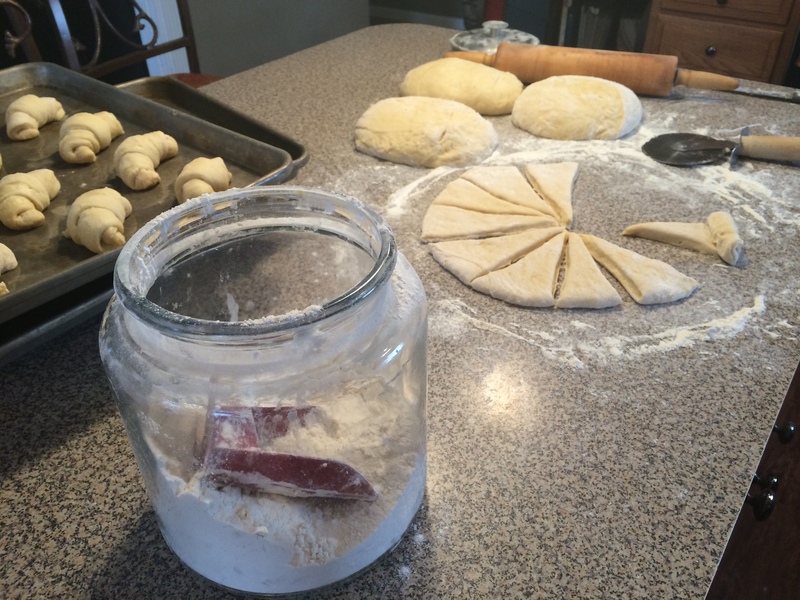 Keep enough flour on hands and dough to keep it from sticking to you or the table. Now you have a perfect ball of dough, I hope. Divide this into portions. This is the fun part! Each portion should be rolled out into a circle. Legend has it that a woman wasn’t ready to be married until she could roll out a perfect circle. The college girls who help me bake post their best circles on Instagram! Rolling a perfect circle is an art, but certainly not necessary to the taste of the roll. Using a pizza cutter, slice the dough into equal pie shaped wedges. Roll up the wedges from the wide end and shape the roll gently into a crescent. Place the rolls on a lightly greased pan (I spray mine with olive oil) leaving space for them to rise again. This will be the second rising and again, will take approximately an hour or more. Remember this is a triple recipe, so don’t have a heart-attack that you will be getting this many rolls with the recipe listed. 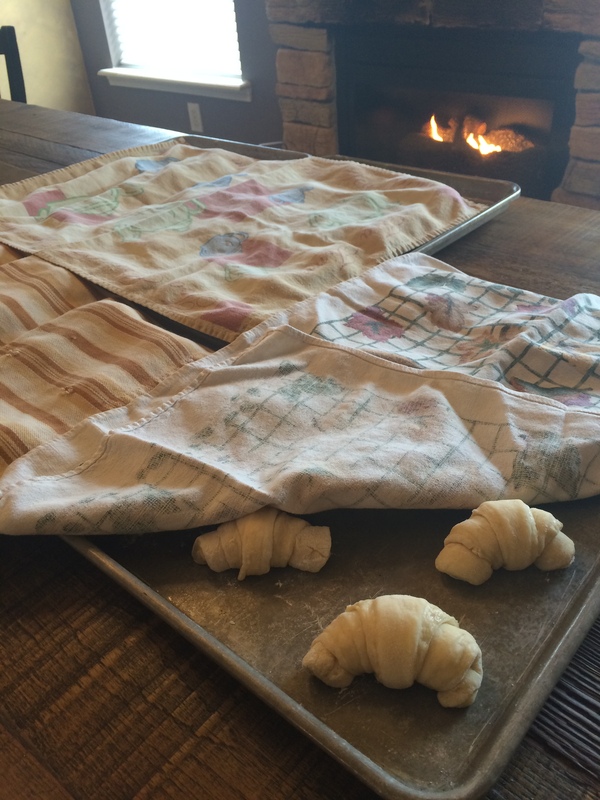 You will want rolls to rise in a warm location, but not in an oven. Too much heat will begin to cook the bread. Next, I cover them lightly to keep the dough from forming a crust. 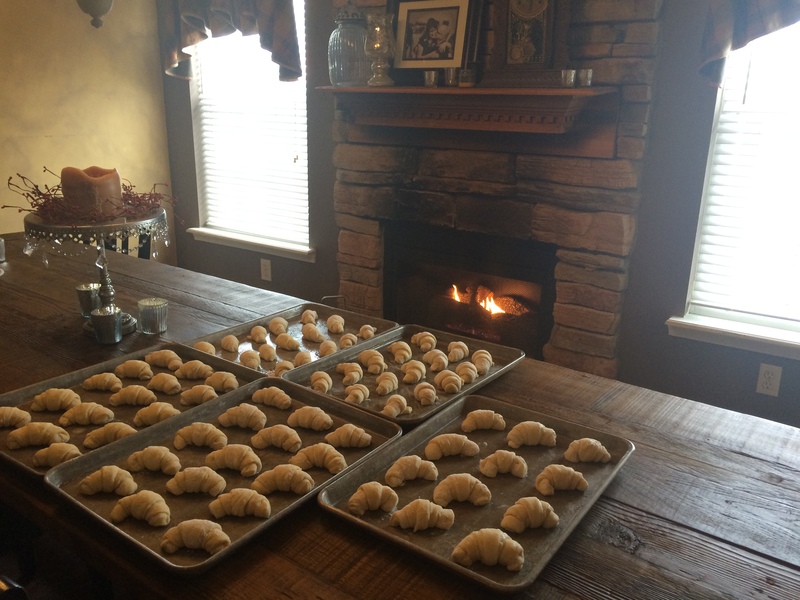 When the rolls have risen to your satisfaction, you get to bake them. This will attract anyone in the house and perhaps people from a 3-mile radius. Nothing smells quite as lovely as homemade bread baking. Bake until they have a warm golden color and then cool on a rack. You may want some butter and jelly handy to go with rolls fresh from the oven but in reality, they are perfect just as they are. When cooled, these rolls freeze or refrigerate well. Chances are, they will disappear long before you think about extending their shelf life! Enjoy. Here is where I share my passion for Jesus and discipling others, my inspiration for marriage, my love of all things domestic, and my addiction to baking.